Now that the winter is settling in, it's time to share a perfect cold-weather soup recipe. 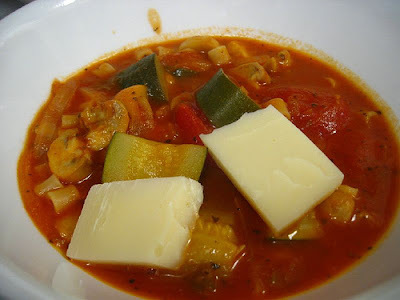 Once again, we turn to Jay Solomon's Vegetarian Soup Cuisine for a classic, healthy and laughably cheap recipe that'll warm you up on even the coldest winter day. You can make this dish in 45 minutes from start to finish, with only about 15 minutes of that time being taken up by "real" work. Then, feel free to sip a glass, relax, and stir the soup occasionally while it simmers. 1) Heat the oil in a large saucepan, add the onion and garlic, and saute on medium heat for 4 minutes. 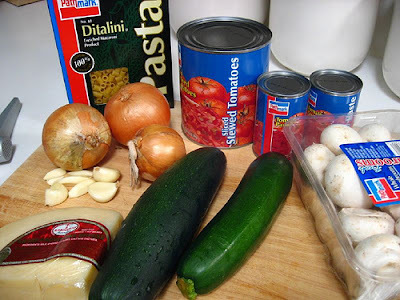 Add the zucchini and mushrooms and saute for another 4 minutes. 2) Add the water, stewed tomatoes, tomato paste and seasonings and bring to a boil. Simmer for 15 minutes over medium-low heat, stirring occasionally. 3) Stir in the pasta and cook for 10-15 minutes more until the pasta is al dente. Be sure to stir every few minutes--the pasta has a knack for sticking to the bottom of the pot if you're not careful. 4) Let the soup sit for 10 minutes or so before serving into bowls. Top with cheese if desired. 1) Use fresh basil (several whole leaves placed in the soup) instead of dried basil. 2) Try 1/2 teaspoon of cayenne pepper instead of 1 teaspoon of black pepper (normally this is a mild soup, so this will put a little more fire into it). 3) Consider adding meat. I'd suggest a mild meat like pork or chicken. This of course raises the ethical conundrum of whether it's okay or not to add meat to a recipe that was originally intended to be vegetarian. 4) I'd encourage you NOT to use more pasta than what the recipe calls for. That is a modification we've attempted that failed miserably--you'll open the pot the next day expecting to see delicious leftover soup, and instead you'll find that the pasta has tripled in size and totally overwhelmed the dish. 5) Last but not least: don't leave out the cheese if you can help it--it's the best part. But you can certainly experiment with other cheeses. I'd consider parmesan or perhaps brie. A death row meal! That's a great turn of phrase--do you mind if I borrow it at some point in the future?